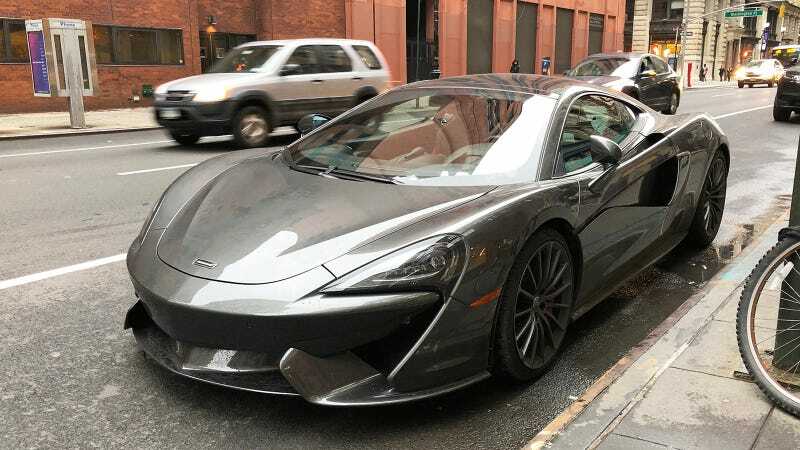 There’s a McLaren 570GT running around Manhattan with diplomatic license plates. Well, license plate. Its owner appears to be using some of that international attaché clout to avoid affixing a front tag. But decoding the rear plate indicates that the car reps the archipelago of Seychelles. To be honest, I hadn’t heard of Seychelles before digging through a few car license plate decoding sites and learning that its country code is “KW.” But it sure sounds interesting: apparently the young country is less than 200 square miles and is home to unbelievably large tortoises. That makes me feel bad for the consuls who had to those islands for New York City, which might be why they have consoled themselves with a $200,000 McLaren. We don’t know much about this particular 570GT besides the fact that it’s been spotted by at least one Jalopnik reader and several staff writers while parked on the streets of Manhattan. It doesn’t seem like a particularly logical choice for city driving or consular work, but what do I know, I’m just out here blogging in sweatpants. I did reach out to a few email addresses listed around the internet as contact points for the Seychellois embassy in New York, but haven’t heard back from them. The Australian consul’s Chevy SS might be a little cooler, but the Seychellois McLaren 570GT is definitely the quickest car I’ve ever seen or heard of to wear consular license plates. Maybe whoever picked it out reads Jalopnik and will hit us up with the whole story after they read this!